The Propulsion Futures Beacon presents a talk by Alan K Prichard FRAeS. 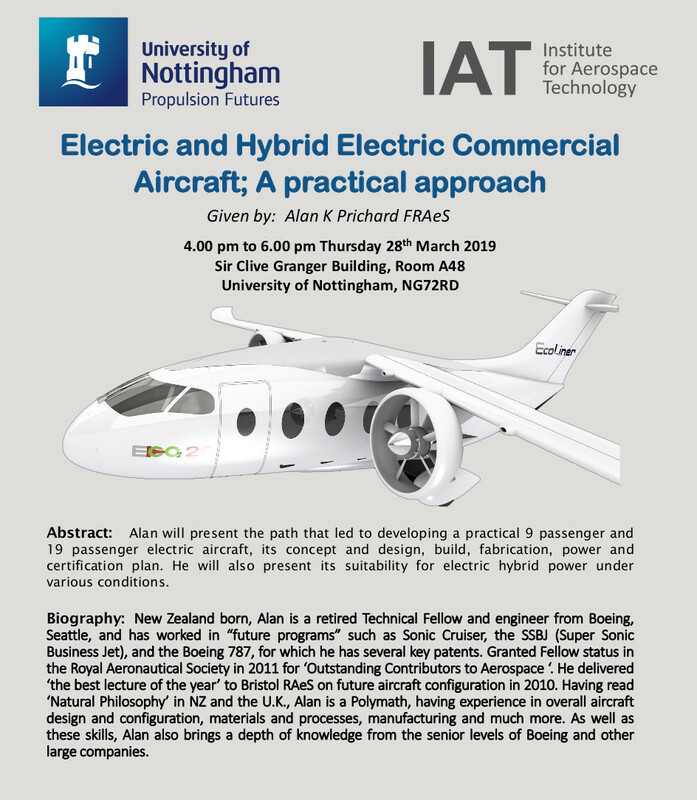 Alan will present the path that led to developing a practical 9 passenger and 19 passenger electric aircraft, its concept and design, build, fabrication, power and certification plan. He will also present its suitability for electric hybrid power under various conditions. New Zealand born, Alan is a retired Technical Fellow and engineer from Boeing, Seattle, and has worked in “future programs” such as Sonic Cruiser, the SSBJ (Super Sonic Business Jet), and the Boeing 787, for which he has several key patents. Granted Fellow status in the Royal Aeronautical Society in 2011 for ‘Outstanding Contributors to Aerospace ‘. He delivered ‘the best lecture of the year’ to Bristol RAeS on future aircraft configuration in 2010. Having read ‘Natural Philosophy’ in NZ and the U.K., Alan is a Polymath, having experience in overall aircraft design and configuration, materials and processes, manufacturing and much more. As well as these skills, Alan also brings a depth of knowledge from the senior levels of Boeing and other large companies. This event will take place 4-6pm, Thursday 28th March in Room A48, Sir Clive Granger Building, University Park. For more information, and to register your place, please visit the event page. Many thanks for pioneering with electric & hybrid electric aircraft. Rather a long time ago I drew up plans for a solar powered airliner. It exist still only on paper, but it contains many innovative design systems, these include the use of light weight construction materials (ie Kevlar & GRP paneling) Also using the wing area and upper fuselage for Solar panel surface area. With these & Batteries providing power for 1 or 2 Rare earth electric motors and aircrews. It gives me a warm glow to think that these systems one day could become mainstream in the aeronautical industries, that the world relies upon for commerce & travel. I actually work at the University of Nottingham, but am unable to attend your talk, which saddens me. I would like to wish you well, & every success with your work.